A top-down scrolling shooter. Players control a helicopter and must fight their way through several levels, shooting everything that moves. 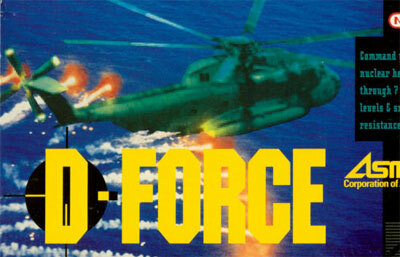 Defeated enemies sometimes drop power-ups that improve the helicopter's standard weapon or equip it with homing missiles as secondary weapon. In addition to the standard "shooting mode" D-Force also features an "exploration mode". In exploration mode, the player's helicopter is attacked by animals instead of warplanes or other helicopters. In this mode, the shoulder buttons can be used to change the helicopters altitude and attack (or dodge) enemies at different heights.